This easy upside-down cake is perfection when made with the kind of fragrant peaches you can only get in mid-summer from a local farm. To bring out the fruits’ delightful flavors, the slices are pan-roasted and then drizzled with a buttery Cognac-spiked caramel sauce (which comes together in minutes — making caramel is easier than you might think!). Moreover, the cake batter that tops the ambrosial peaches gives just the right amount of structure to the dessert while remaining light and moist. A dollop of vanilla Chantilly is the only thing you need to accompany such a gorgeous cake. Happy baking and happy summer! A dessert wine, brimming with stone fruit flavors, is sublime here! Try a Sauternes from Bordeaux or a Riesling Ice Wine from Canada or Germany. Both of these wines have wonderful stone fruit notes that pair well with the peaches, and while they’re both fairly sweet, their inherent acidity will prevent them from being too cloying. Make sure to serve these dessert wines chilled. Step 1: To make the Chantilly – Place the heavy cream, sugar and vanilla in the bowl of an electric mixer and whip at medium speed until thick and ribbony. Refrigerate until ready to use. Step 2: Heat a large non-stick frying pan over medium-high heat. Add the butter. Once melted, add the peach slices, laying them on their sides, and sauté for 3 to 4 minutes until golden. Sprinkle the peach slices with 2 tablespoons of sugar and flip them, being careful not to break them. Continue to sauté for 2 to 3 minutes until golden-brown. Remove pan from heat and arrange the peach slices in a daisy pattern in the prepared mold, making sure to fit the slices tightly together. Set aside. Return pan to stove over medium/medium-high heat. Add the balance of the sugar, vanilla and Cognac and simmer, stirring continuously, until a rich caramel forms (about 5 to 6 minutes). Immediately drizzle the caramel evenly over the peaches and set aside. Step 3: In a medium bowl, combine the flour, baking powder and salt. Set aside. Step 4: Place the egg whites in the bowl of an electric mixer and whip at medium speed until frothy. Increase to high speed and gradually add 1/4 cup sugar. Continue to whip at high speed until firm peaks form, about 1 to 2 minutes. Step 5: Place the soft butter, the balance of the sugar and the vanilla in the bowl of an electric mixer and whip at slow speed until creamy. Add the egg yolks, one at a time, and continue whipping at medium speed until well incorporated and thick, about 1 minute. Add a third of the egg whites to the butter/egg yolk mixture and fold until well incorporated. Then add half the flour and carefully fold it in. Repeat again and fold until the egg whites and flour have been just incorporated. Finish by adding the balance of the egg whites and fold them in until just incorporated. Do not overmix. Spoon batter over the peaches, up to about 1/4″ below the rim. Bake for 45 to 50 minutes until golden and a toothpick inserted in center comes out clean. Remove from oven and let cool for at least 1 hour before un-molding, or keep in the mold until ready to serve. Invert the cake onto a serving platter and gently lift off the wax paper. 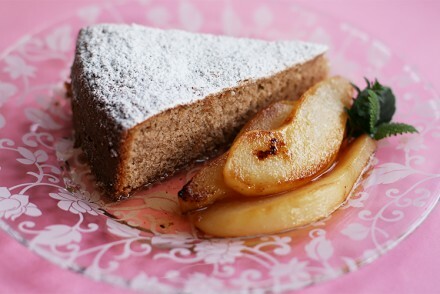 Dust with the powdered sugar and serve each slice with a dollop of the Chantilly. Cook’s note: The cake can be made up to 12 hours ahead. It should be kept at room temperature, but place it in a relatively cool place. Hi Viviani we dont get fresh peaches.can I use tinned peaches?So no need to roast? Waiting for ur reply. Hello Roshan, tinned/canned peaches won’t work in this recipe. I’m afraid they will get too mushy when you pan-roast them. Instead, use fresh pears or apples. Those are delicious in this dessert too. Let me know how it turned out. Happy baking! I just made this yesterday. 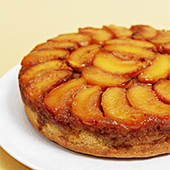 It is an excellent peach cake with a subtle flavour that enhances the peaches. Beautiful to look at too. I served it with the Chantilly cream. My husband and I had it with coffee, sitting on our porch on a lovely spring morning, very early in the quiet, listening to birdsong. In the words of Kurt Vonnegut, “ if this isn’t nice, I don’t know what is”. This is a keeper. Mia, your comment made my heart sing… like a birdsong! Thank you for taking the time to write a note. I am most grateful to you for it. Peach season has not yet arrived in these parts, but another month or so and I’ll be making this cake too… and I will be thinking of you and your husband sitting on your porch, enjoying a slice! Hi Viviane! the cake looks delicious and I want to make a larger batch. Can I double the quantity of all the ingredients (including the baking powder)? Hello Supriya, Yes, you can double all the ingredients (make sure you use a pan large enough so the cake doesn’t end up too thick though). The only thing that might increase is the baking time, but only by a few minutes. 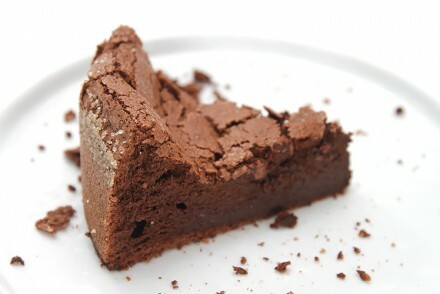 Test your cake as suggested in the recipe and then go from there. Have fun and let me know how it turns out! Hello! I didn’t have peaches so I went for apricot and it was PERFECT! the caramel turned EXACTLY like yours : I had the video playing as I was making the cake and it was the same! thank you for the clear explanations! Oh… your note makes me so happy! I am delighted the cake turned out great. 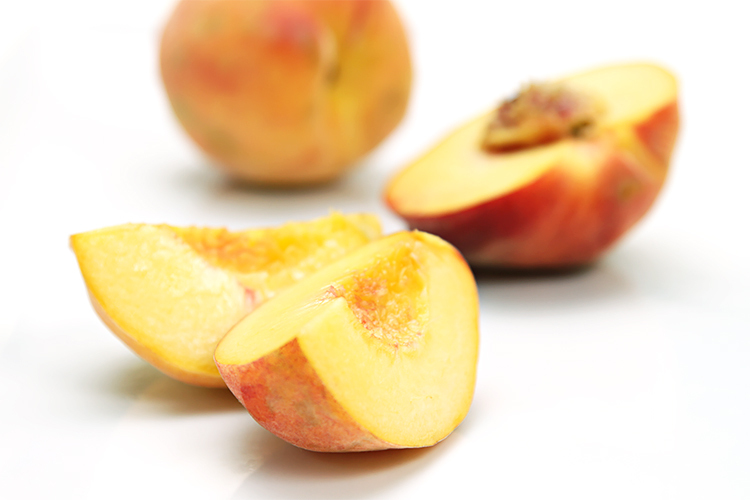 Apricots are a wonderful and most delicious substitute! Thank you so much! I made this cake and it was fabulous. The family really enjoyed it. Thank you for a great recipe. Hi Robyn! Thank you so much for letting me know – smiling from ear to ear! I made this and it is indeed delicious. After watching the video several times for clarity and to made sure I had everything, including all the right pans (which I didn’t), I was ready. Viviane, I applaud your ability to make everything look so smooth and effortless. You twisted the peaches gently and they came apart perfectly. My peaches stuck to the pit. ALL OF THEM. Fortunately I’d gotten extra and could choose the least mangled. I knew then this wasn’t going to be the perfection I’d imagined and decided there was enough Cognac for me and the peaches. After the peach challenge I watched and copied each step with you on my iPad. Thank you for those videos. In the end it was worth it. The cake had a deep peach flavor and the Chantilly was a perfect match. Today I bought nectarines to try. I still have Cognac left! Hi Bonnie! Thank you so, so much for your wonderful note – it makes my heart sing! I’m so glad the video was helpful. This cake is not complicated, but there are a few crucial steps if you want it to turn out perfectly. I am so happy I was able to communicate those clearly in the video. As for those stubborn cling-stone peaches, I have a trick: A peach pitting spoon (http://fowlersvacola.com.au/shop/preserving-accessories/peach-pitting-spoon)! This tool has been in my arsenal for years and I don’t use it that often, but it sure comes in handy when the peaches are cling-stone! It’s also great for plums. 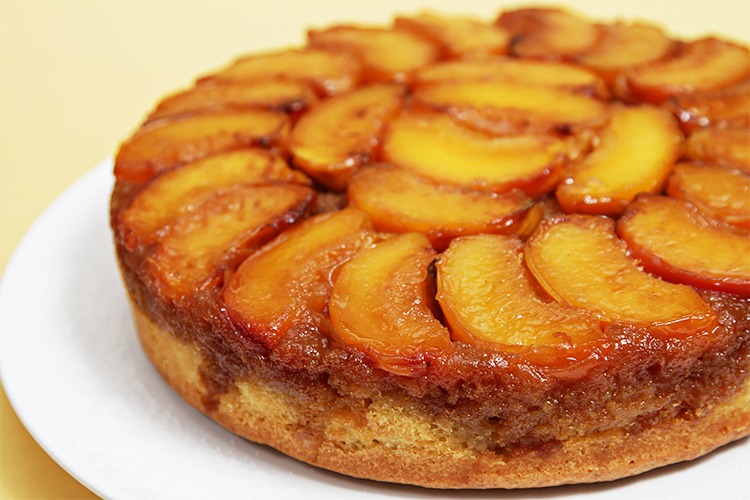 Have a wonderful time making this cake again with nectarines. The second time you make it will be a breeze. Happy baking! I did make this again with the nectarines. They came off the pit with ease and since I’d done it before, the rest of the cake was a breeze. This was also delicious and the cake was gone (with rave reviews) within 24 hours. I thought the peaches gave more depth of flavor, so I’ll be ordering one of those peach pitting spoons. One question on the caramel. I noticed both times in the pan, after I’d topped the fruit, what was left in the pan turned into hard candy. It didn’t seem to matter in the cake, but did I overcook it? Hi Bonnie! Thank you so much for your note. I knew the nectarines would be delicious with this cake too, but they have a bit less acidity than peaches, which might make them less flavorful when baked. As for the caramel, yes, it is normal for it to harden when you pour it over the peaches. It liquefies again when the cake is baked. Enjoy every bit of the last days of the summer! What a wonderful cake! 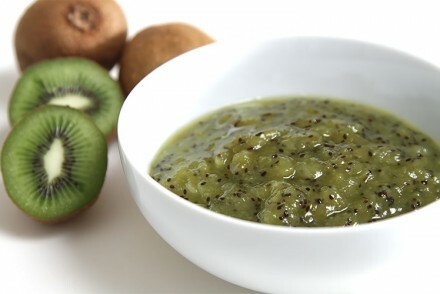 Lush with summer flavor and gorgeous too! I just bought a bunch of local peaches and was wondering what I could make next! 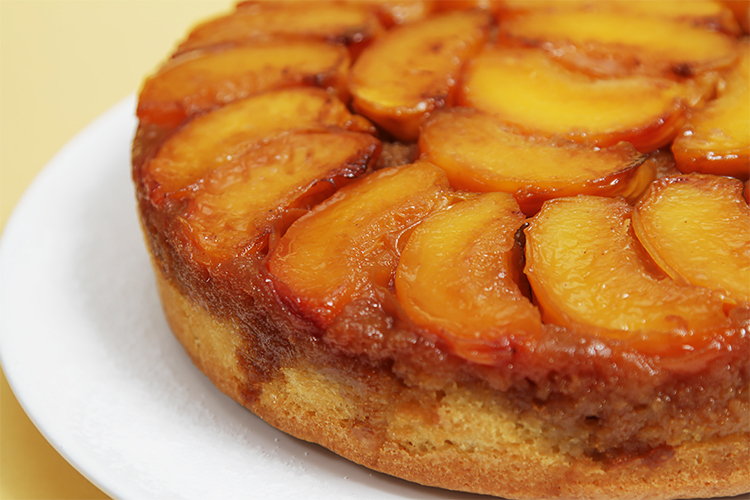 It’s been years since I’ve made a peach upside down cake (pineapple doesn’t fly here!). Yours look exquisite!! So easy to forget that upside down cakes can be changed up. Can’t wait for Ontario peaches to try this and wow on the cognac caramel! I’m not a big cake eater, bu this one could easily change that. What a love cake! I need to go to the market for peaches. This is a great recipe. Pinning. Thank you so much Viviane! I love your site. I love this dessert. It’s beautiful. Perfect for farm fresh fruit! Thank you, El… and big compliment coming from the “queen of desserts”! Judit + Corina, Thank you! The Riesling Ice Wine is indeed quite delicious with this cake, especially on a hot summer day… Cheers! I can almost smell those lovely peaches from the photos. What a delicious-looking cake! It’s Ontario peaches time, a really big deal here. this looks amazing and might have to make it. And wow on the Cognac caramel. Thank you, Evelyne! It’s New York peach-time too! We can’t get enough of them… Very glad you like the Cognac caramel too! Just stunning! I’ve been scrolling through all your recent recipes and there’s not one thing that you’ve made that I wouldn’t be thrilled to eat! Anita! Thank you so much for your very kind words… You just made my day! Indeed a perfect coffee cake, Viviane. The brandy caramel must be terrific paired with the sweet juicy peaches.